Shallow water and mucky shores of ponds, lakes, marshes, and bogs, sometimes forming floating mats, often grows in very soft substrates. The stems form an extensive pale spongy cork-like tissue (but containing cytoplasm) in the water. This “aerenchyma” forms at the base of the stem and at the tip of an arching stem when it strikes water and roots. 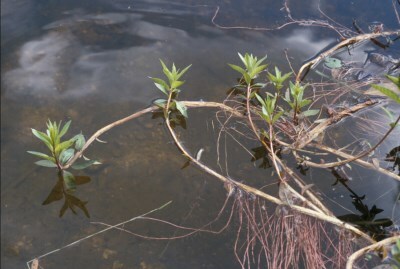 The arching stems with enlarged floating tips, sometimes with another low arch developing beyond, are a unique aspect of this loosestrife. MICHIGAN FLORA ONLINE. A. A. Reznicek, E. G. Voss, & B. S. Walters. February 2011. University of Michigan. Web. 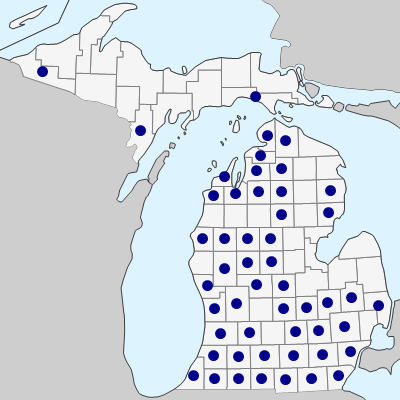 April 22, 2019. https://michiganflora.net/species.aspx?id=1659.